Easily store and move your Rico brand stacking chairs from OFM with this 305-dolly chair storage cart. Made from metal, this cart is sturdy and strong enough to move up 15 of these chairs at a time. This chair dolly is compatible with Rico chair models 305, 305-116, and 306. 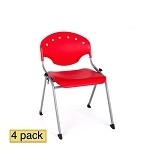 Includes the factory warranty from the manufacturer, OFM, Inc.
Set up dimensions: 21.5 inches H x 23 inches W x 24.5 inches D.
Cart weight: about 10 lbs. Storage cart capacity: 15 chairs. 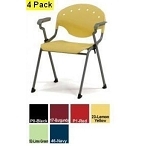 Compatible with Rico stacking chair models 305, 305-116, and 306. Q: Who handles the warranty for this chair dolly? A: The warranty is through the manufacturer, OFM. This chair dolly ships from the warehouse in Holly Springs, North Carolina. When ordered alone, the product ships via FedEx for a doorstep delivery. No signature required for residential addresses. As we ship this chair dolly from the manufacturer, OFM, if you need to return this product, please contact us first. We will need to get a return authorization number and a return shipping address from OFM for your order. Please also review our entire Return Policy for return costs and policy details. Dimensions: 72" x 60" x 48"